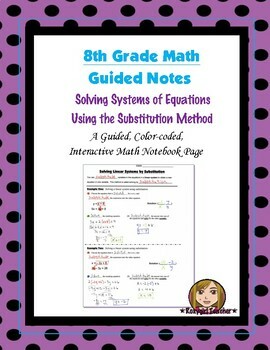 This is an 8th Grade Common Core guided, color-coded notebook pages for the Interactive Math Notebook on the concept of Solving Systems of Equations by Using Substitution. 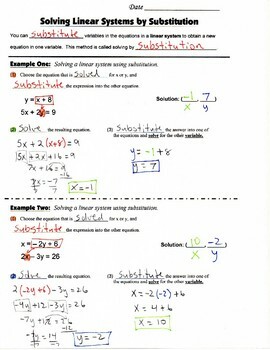 Included in the notes are step by step examples of solving systems of equations using the substitution method. Blackline master and color-coded answer key included. 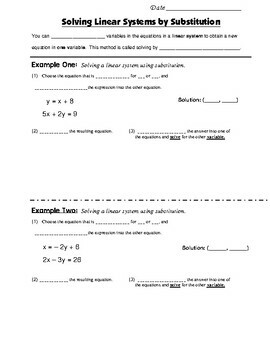 ** My Interactive Note Pages include all or some of the following: step by step color-coded notes, diagrams, academic vocabulary, graphic organizers and example problems. My Interactive Note Pages were designed to use in my IMN. The students keep the color-coded notes in a 3-pronged folder, and the notes are set up to print back to back.